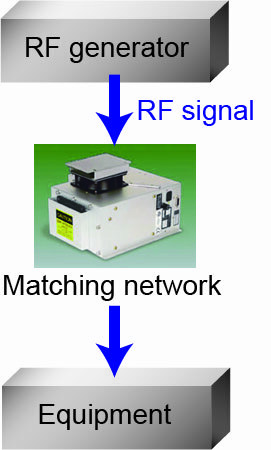 Matching networks efficiently supply devices with RF. Etching semiconductor with high resolution(μm, nm scale) is applied to various technologies. (electronic engineering, biology, medicine, automobiles and so on.) By using plasma for etching, microscale pattern is formed. In order to generate plasma efficiently, impedance matching (between generators and equipment) is required. Without impedance matching, reflected waves are generated and it is difficult to send RF signals efficiently. By using matching network, we can prevent reflected waves occurred. Matching networks consist of air variable capacitors and coils. By regulating capacitance of variable capacitors, impedance matching is enabled.